I am excited to have been awarded the 2013 Capricorn Yanchep Residency, managed by Artsource. I will now be able to work with local artists and community members in Yanchep, north of Perth, as I prepare for my August 2014 exhibition at the City of Wanneroo Gallery. 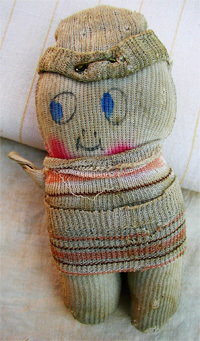 My interaction with the locals will include the making of a whole community of sock dolls like this little fellow who I found at an estate sale in Kansas a number of years ago. Yanchep, like many City of Wanneroo localities, has a community history of self sufficiency and making-do, also central to my family heritage. My grandmother, living in the remote Eastern Goldfields, made dolls for her children from materials she had on hand. The cloth doll, made with much care and attention to detail, has a hand painted face and a dress which makes use of snippets of lace and leftover curtain scraps. The other doll is more roughly put together, a rag doll made from black ribbed singlet material and stuffed with strips of cloth. This entry was posted in Arts residencies and tagged Eastern Goldfields, making do, Rag doll, Two Rocks, Yanchep on September 2, 2013 by Wendy Lugg.